Our lawn restoration service is recommended for homeowners looking to restore their lawn area through aeration and over seeding to make it look as healthy, lush and attractive as possible. Using our detailed, effective, proven approach to lawn restoration, we’ll engineer an efficient and effective transformation of your damaged lawn. Lawns thin out each year due to wear from foot traffic, leaves lying on and within the grass during the Fall and sometimes through the Winter, and stress caused by the Summer heat. Schedule an appointment by September 31st. If you’d like to restore your lawn this Fall, contact us no later than September 31 to schedule a convenient time for owner Jeff Cartwright to discuss our lawn restoration process. September 31 is a deadline we strongly adhere to as a cut off for scheduling this service so that we are able to provide our clients with the best possible results. This deadline allows your aerated and over-seeded lawn to maximize its growth potential during the the months where grass growing conditions are optimal with warm days and cool nights. Once we experience consecutive frosts in the Richmond area, usually in early November, all grass germination ceases for the season. 1 Prior to aerating, you’ll need to cut your lawn at the second lowest setting on your mower and bag all grass clippings. 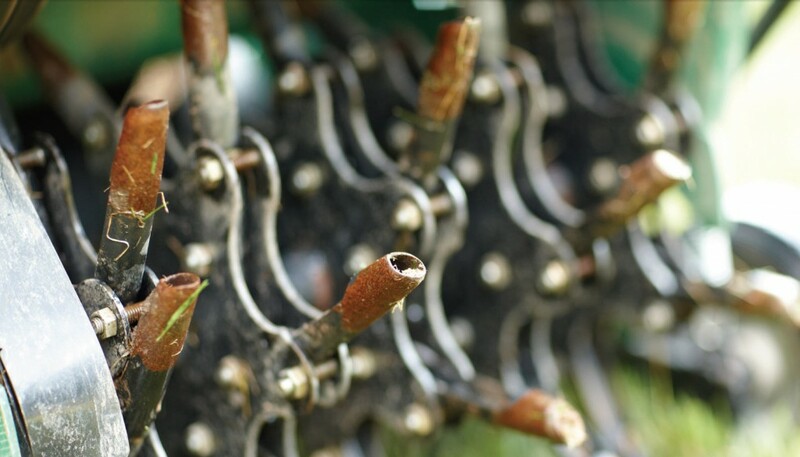 This is imperative as it will allow the aerator to easily penetrate the ground surface. Cutting your lawn short is also extremely beneficial so that grass seed can easily make its way into the ground without interference. We’ll also instruct you to heavily water your yard for several days to saturate the dry ground in preparation for aeration. Prior to aerating, all clients with irrigation systems will be provided with marker flags so that you can mark all obstacles in your lawn (e.g. irrigation heads, valve boxes, shallow irrigation pipes, shallow wiring and any other items) that may be damaged during the aeration process. 2 We’ll use an aerator to leave numerous two inch holes throughout your lawn surface, making multiple passes so there is no discernible aerator tine pattern in your lawn, resulting in much more uniform grass growth. We pride ourselves on this very important part of our lawn renovation and lawn restoration service as many (if not all) of our competitors complete only one or two aerator passes, causing lackluster, patchy results with noticeable stand-alone plugs of grass growing in a lawn. 3 Once a yard has been aerated in accordance with our high standards, we’ll heavily over seed your lawn area using a 99.9% weed-free tall fescue blend seed which is engineered by Virginia Tech’s College of Agriculture to thrive in Richmond’s climate. We’ll also add lime and fertilizer to your lawn area to jump-start seed germination. 4 From this point forward during the germination process you’ll need to water your lawn area as instructed by Cartwright Landscaping. Watering your lawn during this process as instructed plays a large part in the success of your restoration. If you do not water as instructed, your lawn restoration results will suffer. When watering, the goal is to keep the ground moist without flooding your lawn. Make certain to avoid pooling of water as evidenced by puddles or excessive run-off with streams of water running through your yard. Puddles cause the seed to move to the puddle edges, resulting in bare spots, and streams will leave lines of bare spots running through your lawn. To achieve the best grass germination results, we recommend for three weeks watering early in the morning (between 5AM and 7AM) and then again in mid-afternoon (around 2PM or 3PM). During this stage of the process, you should not cut the grass and minimize all foot traffic across the yard. This is necessary for the new seed to germinate effectively and take root in the soil. The duration of each watering cycle will be determined by the size of your yard or how much water is dispersed from your sprinkler(s) or irrigation system. Smaller yards require a shorter watering duration while larger yards will require more time. Please pay close attention to the first few times you water to determine an appropriate amount of time for each watering cycle. Seedlings in any shaded areas will take a little longer to germinate and grow. Please also be aware that the more you water, the more saturated the ground will become, which may result in you having to decrease your watering times. You should also refrain from watering the day after a long soaking rainfall. 5 As your new lawn begins to grow and fill in, approximately three weeks after the restoration service, please cut your lawn at the tallest setting on your mower. Please use due care when turning the lawn mower as the ground will be wet and the new grass can easily be uprooted. Throughout the restoration process and into the Fall it is also absolutely necessary that you use a leaf blower to gentle and often blow leaves of the surface of your lawn. When leaves cover or become embedded in the new immature grass, photosynthesis stops due to lack of sunlight getting to the new grass, which can damage or kill tender young grass in just a handful of days. If you’d like Cartwright Landscaping to assume responsibility for blowing leaves from your yard during your renovation, please let us know. 6 Once your restoration is complete, we strongly advise you to take advantage of Cartwright Landscaping’s lawn maintenance program. This service will keep your lawn and landscape looking its very best. And, through our exclusive partnership with Virginia Green Lawn Care, your lawn will remain lush and weed-free year-round.